Genius Loci Games: Contest - Talk Like a Pirate Day! From now until 8:00 PM tomorrow anyone who posts their best gaming related pirate story in the comments section of this post could possibly a .pdf copy of Yarr! 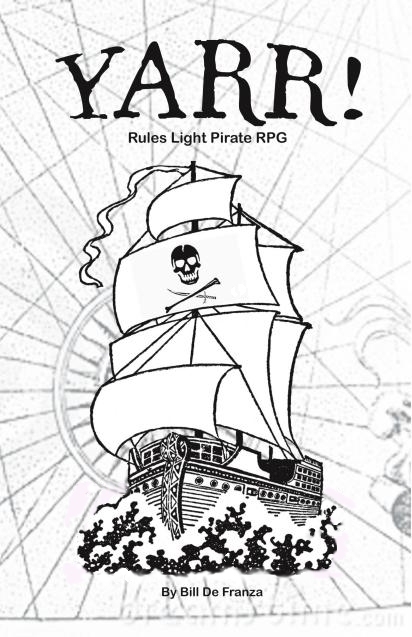 Rules Light Pirate RPG by BD Games. Winner will be announced Friday morning and the top three entries will be recognized in a post here on Friday. I be findin' me best story comes from a jaunty tale of'n the future. We be deliverin' a suspicious package to another planet far off yonder past the salty sea air and stormy skies. Our ship be not the kind that sails through water. Nay it be a ship that flies like the seagulls! Yet, tis not all the ship did. The ship dropped like seagull poop onto a clean deck. We run aground over open water and had us no chance of escaping the sumbergin' ship headed down to Davy Jones' locker. Yet I be not scared as my well sharpened skills were sailin' with me that day! I unsheathed me mandolin and be proceedin' to use my "crooning troubador" skills to let out a sea shanty worthy of launching an armada! I sang well of them mermen who swam slyly below the treach'rous waters. They be hearin' me song from miles around and gatherin' to help us stranded dogs. Me sealegs almsot gave out when one be thinkin' me song to be an insult, but I sang on like the endless waves about us! The mermen saved our lives that day, and I be runnin' through any lubber who says an ill word about them limey mates of mine!